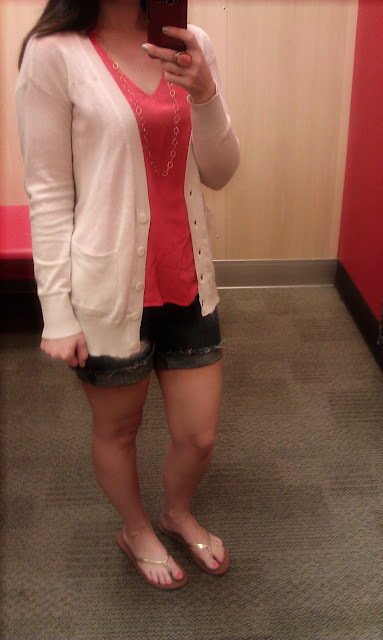 In keeping with my Target theme from my Friday outfit, I decided to go to one of my favorite stores again. I had success with my last shopping trip, so I thought I would check out the dress selection. I only found one that caught my eye. However, the makeup section never ever fails me, and I found some great polishes I have been admiring from Orly. I also got another concealer palette from Sonia Kashuk and I was ecstatic because I have a difficult time finding them these days. I hope they aren't discontinuing them! L to R: Rage (rose gold! ), Cotton Candy, Lollipop, and Kiss the Bride. As happy as I am that it's officially May, my allergies are killing me! My eyes have been watering nonstop for the past two days and I'm constantly itchy. Is anyone else having problems with the season? My boyfriend went to the doctor for his allergies, and the doc told him this is the worst season he's ever seen. His office is flooded with people who are miserable right now. I'm taking Claritin and calling it a day! I love both outfits, Target is really great. Did I miss the announcement of the Shopbop winner? Love your running around outfit - that H&M sweater is lovely. Love how your ring complements your tank...very cute! Faith J: I actually emailed the winner instead of announcing it! I didn't want to dedicate an entire blog post to it. Thank you for entering though! Awww girl you are so sweet I heart you too! :) Omgosh the dress with the cascading ruffle layers is so cute on you! You should try to see if you can find it online. I swear target has some super cute clothes! Love your beachy running around outfit! Omgosh rose gold nail polish that sounds soooo pretty. You have to show us a NOTD when you paint your nails with that color pretty please! ha - i have that dress in the red print!! can't wait til it's warm enough here to wear!! let alone shorts and flip flops! ha. lovely post as always. You look fantastic! I love that dress on you - so flattering :) Just followed your blog! I totally have allergies this year too and I've never any spring allergies. Mostly dry, puffy eyes. Eek! I wish my town had a Target! The dress is super cute! Lisa: You are the nicest person! Thank you =) I'll be sure to do a NOTD with that color soon! Katharine: Thank you, I hope you enjoy my blog! Ness: I hope you feel better soon too! allergies are no fun. Aw i like your casual outfit, i'm digging the boyfriend style shorts. I'm so HAPPY to see that you picked up some Orly polishes, especially in the color Rage! I loveeeeeeeeeeees it! Love your "running" around outfit...you're so chic! The dress is cute...it's too bad the fit was no bueno...I hate that! The nail polishes are all sooo pretty...especially the rose gold! How cool is that?! Love the outfits! Especially the 2nd one! Wow, such cute outfits. Looks like a very successful shopping trip. Nice post, following you now. Cute dress! It looked good on you! I love your running around outfit - great color and looks comfy! Frankie: Yes, the wind makes it all that much worse! Chaotic Cookie: I admit, seeing it on your nails made me run out and buy it! I can't wait to wear it, so pretty! Natasha: Thank you, I will do a post featuring the rose gold polish soon. Thank you so much ladies for the feedback! I absolutely LOVE your necklace. Gorgeous!!! i'm loving the dress in the first shot. i have that ring 2 and it's one of my favs. would love it if you would take a look at my blog and follow it if you like! i love target. honestly, i can't walk out of there without spending a ton of money. that being said, i love that first dress on you...def a winner! I love new nail polish hauls! I'm super excited to paint a fun design on my nails tonight, haha! 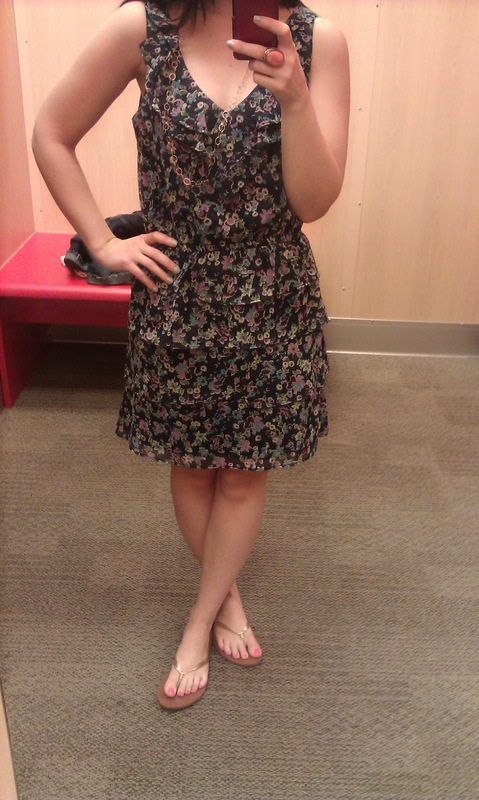 Target is amazing, and I actually love that dress on you. The print is darling, and I love the ruffles! However, if it doesn't fit 100% well, then I can see why you'd pass on it. Sorry to hear about your allergies! I know someone who swears by "building allergy immunity" by eating local honey. You're apparently supposed to start eating local honey about 2 months before allergy season, and that'll build up your tolerance for the pollen in your area. Have you tried that before? Anyhoodle, I hope you feel better! !